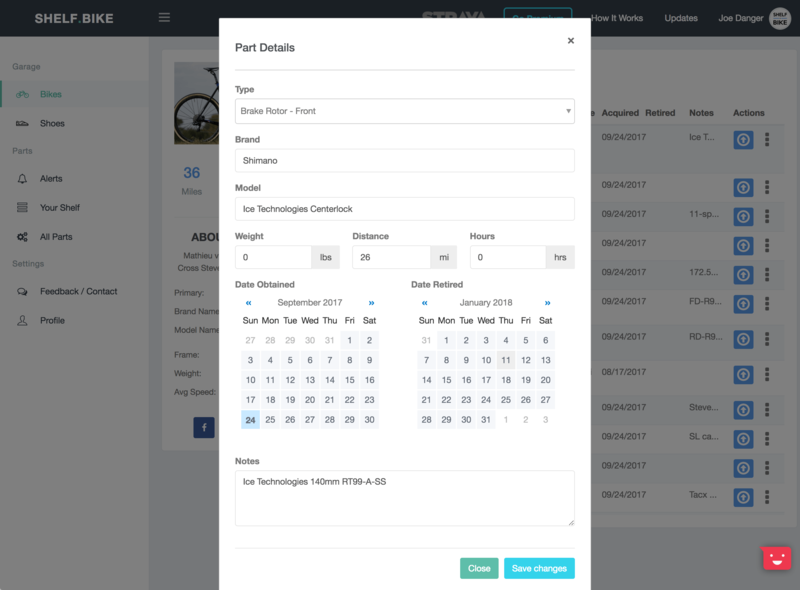 We're working on a great way to manage the wear and tear on your bikes and parts. Your feedback has been instrumental, and we're making this for you! shelf.bike is an interactive bike, part and wheel tracking system for the committed athlete. Keep an eye on all your bikes in one simple dashboard. Synchronize your bikes right from the home page. All of your bike parts easily fit on the bike details page. Find upgrades or swap parts on and off of your bike with the actions dropdown. Manage your part details with the parts editor. Update the weight, date retired, any notes on when it was last serviced. Help me, help you. The notes section really helps when you walk into a bike shop and can tell them exactly when and how long it's been since the part has been replaced. 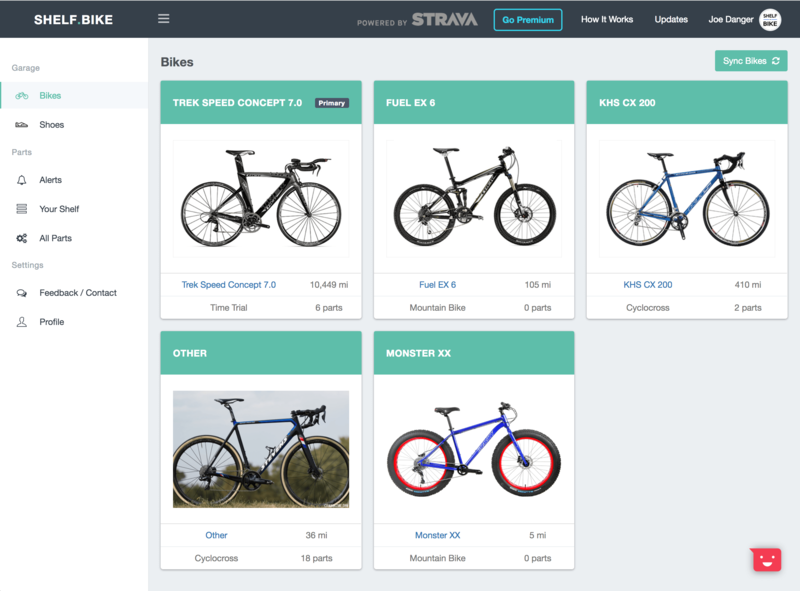 We're working on a great way to manage the wear and tear on your bikes and parts. Knowing the wear and tear on your parts is a guessing game, let us track it for you. 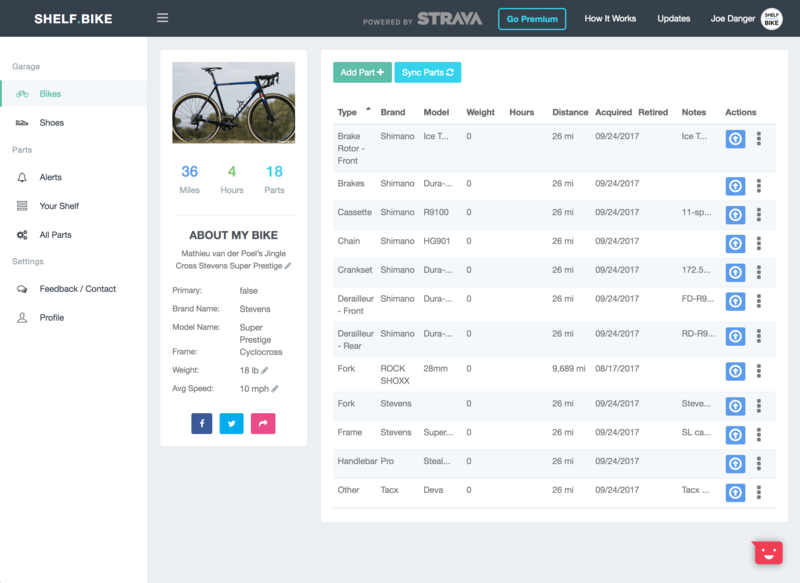 Record and track hours and mileage on individual bike parts. How many hours your race wheels have, or miles on your chain. Keep up to date with regular maintenance, so you know when parts will fail, and when to call your local bike shop (LBS). Setup notifications so when a certain part has reached it's hour or mileage, you'll be alerted. When a part needs to be replaced, we make it simple to find a replacement. Great product - hitting a usage case that Strava has implemented so badly! Finally! I've been waiting for this for years. The following features are planned, your subscription will help shape the product and fuel development. If you have any questions about payments, please email us. These manufacturers would be wonderful to partner with, email us for partnership opportunities.